Showing from 22nd May until 24th July at Galerie Lecq in Rotterdam the installation Streetwalker Sluice. The installation is a memorial to the former street/heroin prostitution area of Rotterdam. Prostitution was condoned here in the 1980's and '90's until the area was wiped clean and heroin prostitution abolished from the city. Streetwalker Sluice is therefor a monument to the rough edges Rotterdam was renowned for late 20th century and now steadily being gentrified. 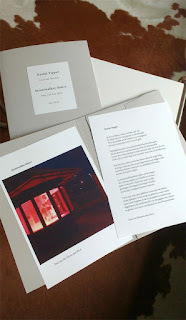 Besides the installation an edition has been published in cooperation with poet/writer/performer Gino van Weenen. 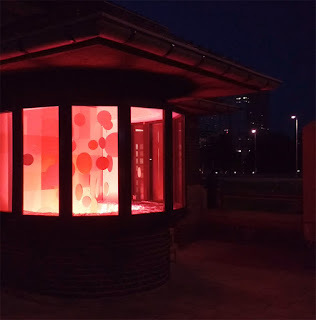 He has written a poem especially for the occasion which has been paired with a night view image of the installation. The edition is available at the opening 22nd May at a reduced price. It can also be ordered by sending an email. News and updates on exhibtions, projects, publications etc. © paul van den hout. Awesome Inc. theme. Powered by Blogger.